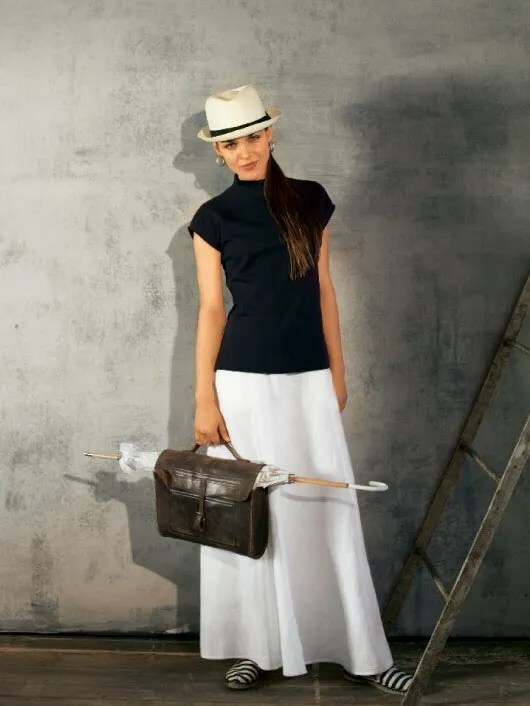 There are several patterns from Burda I’ve had my eye on for years and years. 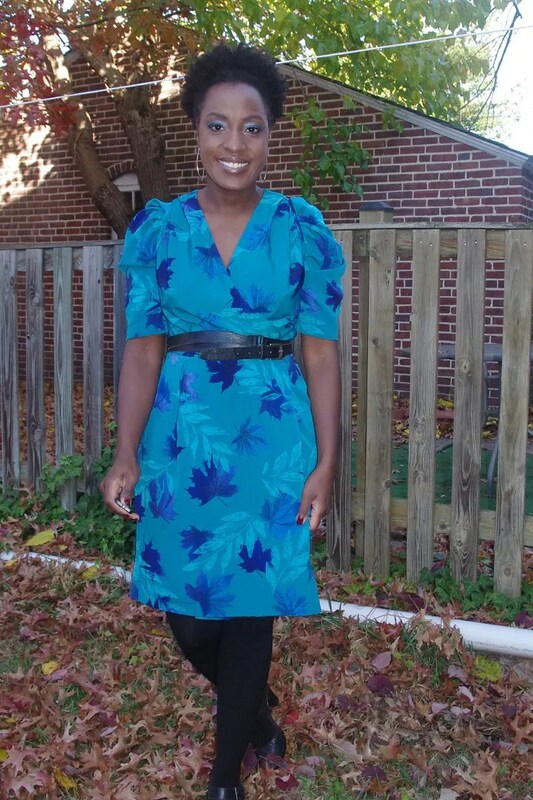 This wrap dress with the drapey sleeves is one such. I sewed it way back in August to wear on my dativersary. But, it seemed too late fall for what ended up being a warm summer night. Plus, I thought it was more mid 80s corporate takeover than va va voom. I meant to wear it and take some photos before two months passed. But, wonderful and terrible things happened at the same time and now I’m just getting around to actually wearing it and taking pictures! 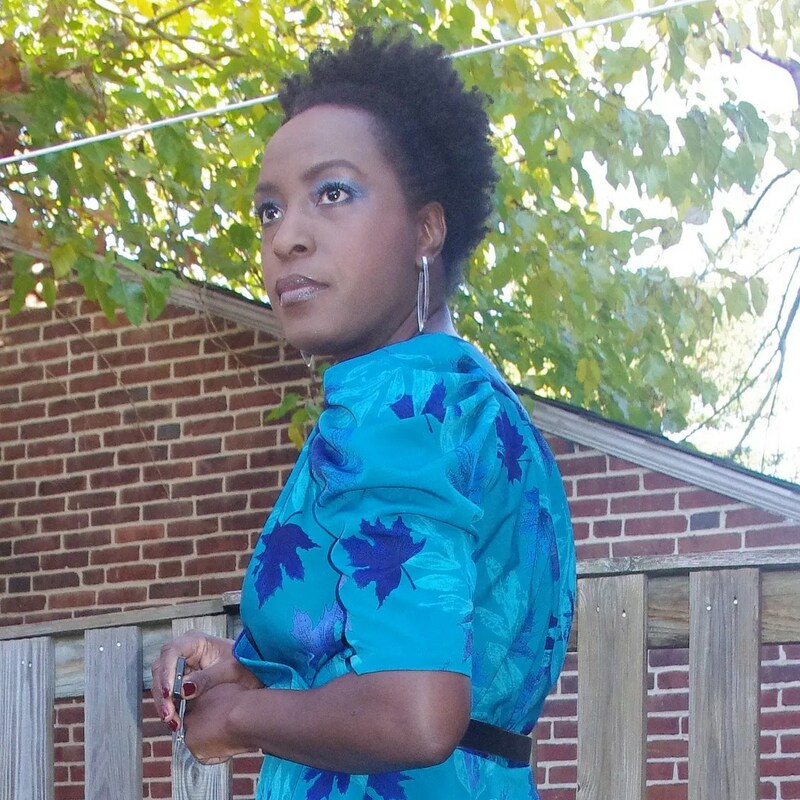 I was drawn to the drapey sleeves and the wrap style (totally flattering on me) and the relatively straight skirt. 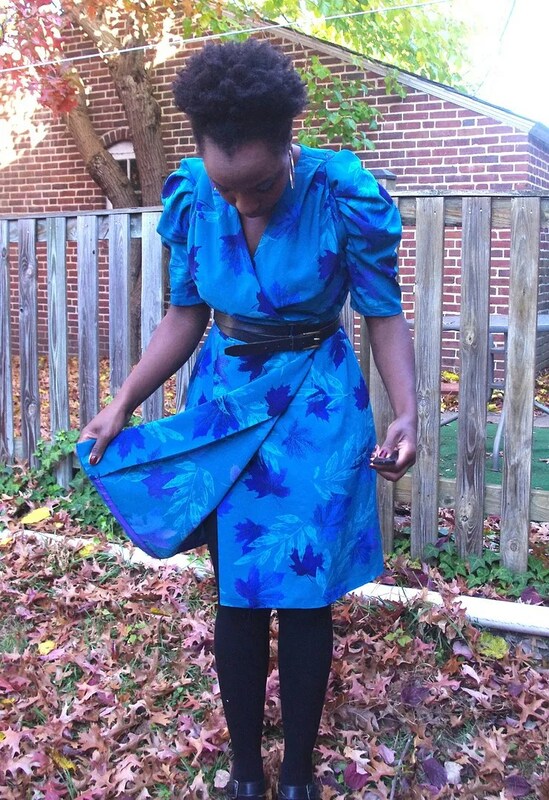 For this dress, I went in to the Carol Collection and chose these blue with purple maple leaf motif. Do you like that my dress has maple leaves and there are maple leaves on the ground? Do you? Yes? The fabric is a polyester print with a thick silky hand (confirmed by my burn test). It’s totally Alexis Carrington from Dallas, no? 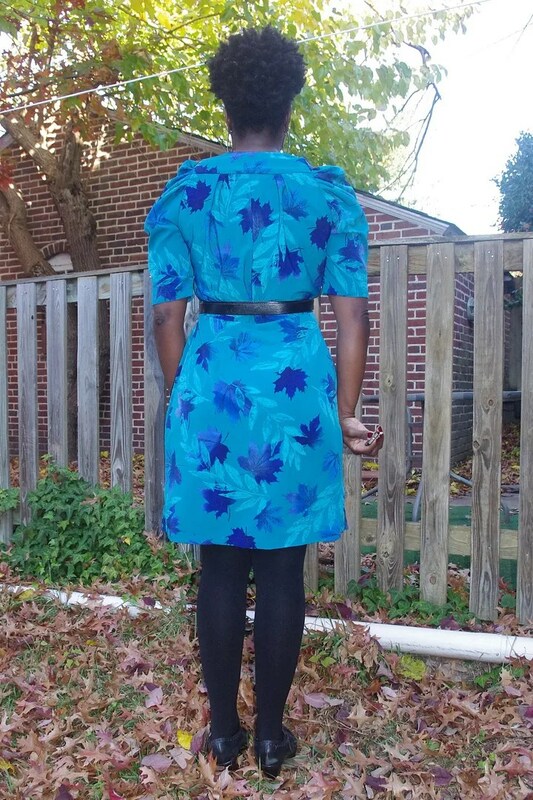 I also considered naming it the Oh, Canada Dress by virtue of the maple leaves. I loves it! I didn’t change too much here. I made a FBA (and of course forgot to make the same adjustment to the facing). Yep. I sewed the facing too. I don’t know why I’m not hating facings like I used to. On this, I love the smooth and firmness of the wrap. I reinforced the neckline, armholes and waist for support. I don’t have terribly much to say other than I really love this dress. You’ll never find something like this in the store. And, it’s somehow ‘dressier’ than my other work dresses. 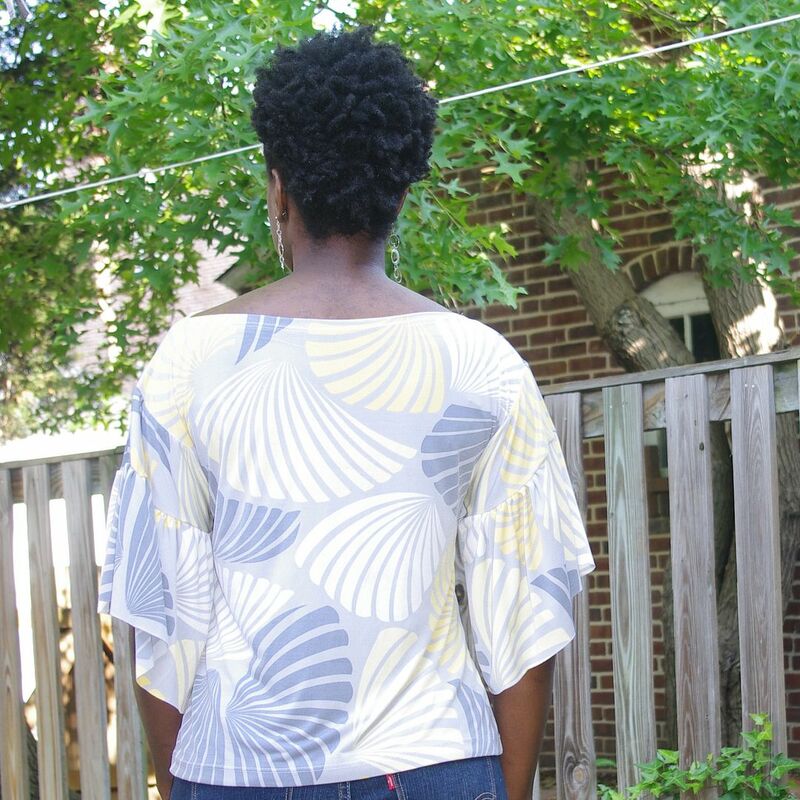 I don’t think my sleeves look anything like the draft nor the model’s. Mine don’t seem quite drapey enough. Nice pattern. Will def be making it again in the future. Especially since it has sleeves! I’m on to my second Purple Friday ensemble for this football season. Hey there Oona… how about that game on Sunday? In Baltimore, we wear purple for our American football team the Baltimore Ravens on Fridays. Why? Well, they mostly play on Sunday and Purple Fridaysare a way to show pride and support in the team. Did I mention my house is right behind the old Memorial Stadium? 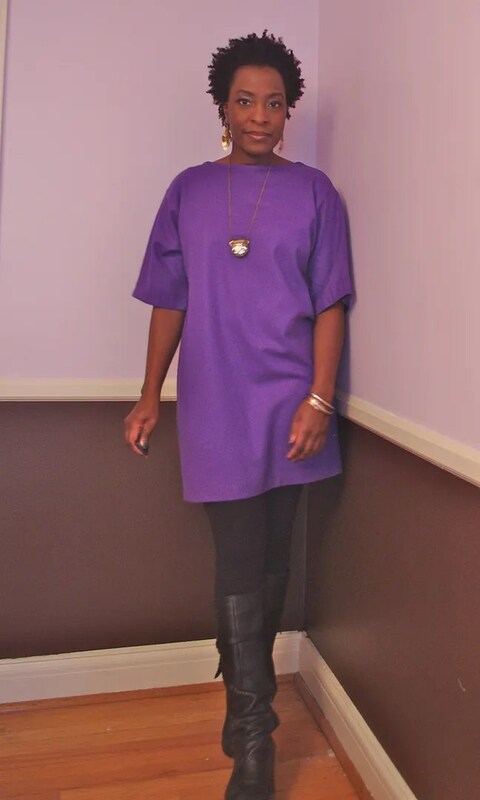 I wanted to make a simple shift for Purple Fridays that could also be worn on the weekend during winter. I want more casual clothes that look nice and not ‘I rolled out of bed and threw on yoga pants’. 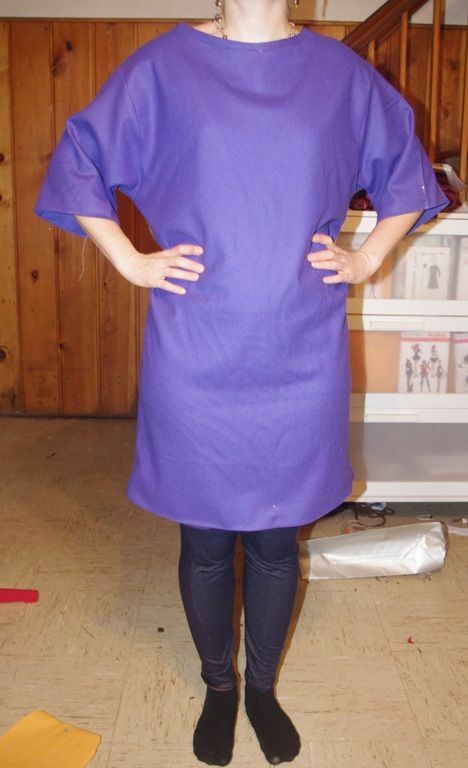 I started the shift dress from the May 2011 Burda Magazine during Superstorm Sandy. It was a simple project that I could complete in a day. And, I did. A few hours actually. But, I’m salty about the fit with those fold lines under my bust. I’m not sure if the need for an FBA would solve the problems. 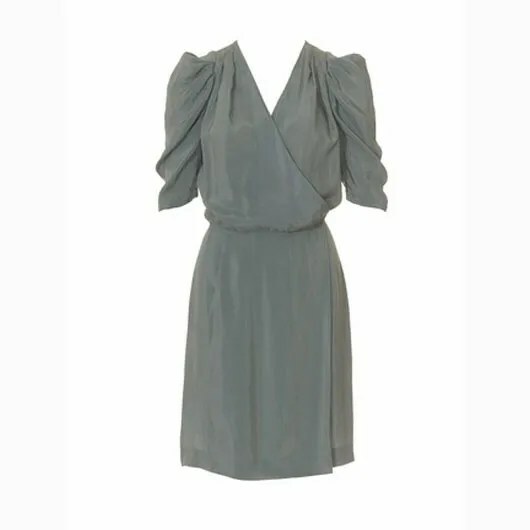 I know it’s a another sack dress but the folds are A-nnoying. Maybe one fold for each 1/4 inch I should have adjusted for? I asked a few friends that are smaller up top to try on and the folds go away. Here on Trena (obviously three sizes too big for her too) and below on my B Cup dress form. I decided to forgo the facings and use a woven bias binding. This is my first time doing this kind of finishing technique on a woven and I’m really pleased. I also like leather and contrast bindings I see on RTW and now I have a good way of doing them consisently well. The material is a wool in a violet shade of purple from the Carol Collection. 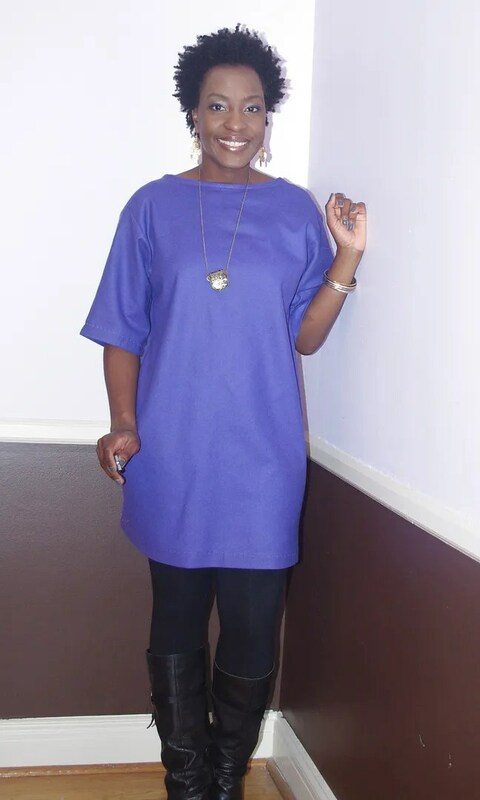 I originally thought I’d make a skirt in the fabric but Purple Friday called and I thought this shift would be fun. Oh, here’s a photo of the back. I omitted the ties (and the pockets). I can kind of picture metal chains instead. Hmm, maybe a T-back shirt in black too (my bra definitely shows without). Ooh, a lacy T-back would be hot. 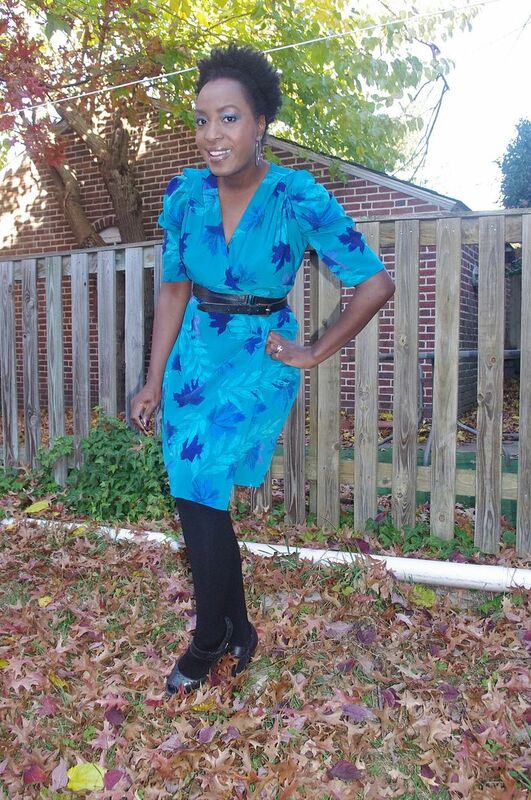 The dress looks pretty good in movement and I think it works well with the leggings and boots. It’s fun because the front is simple and all the interest in really in the back. It is just the look I wanted. Casual, but styled. My immediate boss was a fan. She said I was dressing rather chic lately. I realized after she said so that she never wears prints and for work only wears black, navy and sometimes white. Her clothes are very tailored and architectural. 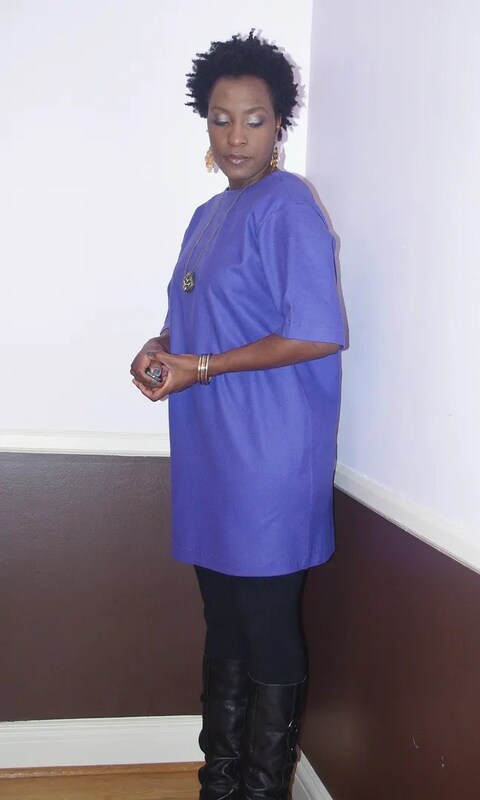 She also specializes in large earrings and big jewelry. I like her style. I wouldn’t say this was chic exactly. But, very minimalist. I have about three garments she’s really complimented. Hmmm, that might make an interesting post! I think I’m going to make two more Purple Friday items. That let’s me get through a month without repeating. One of the holes I’ve noticed in my closet are ‘dog walking clothes’. I have lots of nice things for work. But, very few things that are casual ‘throw them on’ items. I don’t even own a pair of non-running shorts! For the Seersucker Social, I went more seersucker than vintage. I knew I wouldn’t have time to make a new outfit. But, I was kind of disappointed in myself. Part of the fun is dressing up! I looked like I was heading to the office. 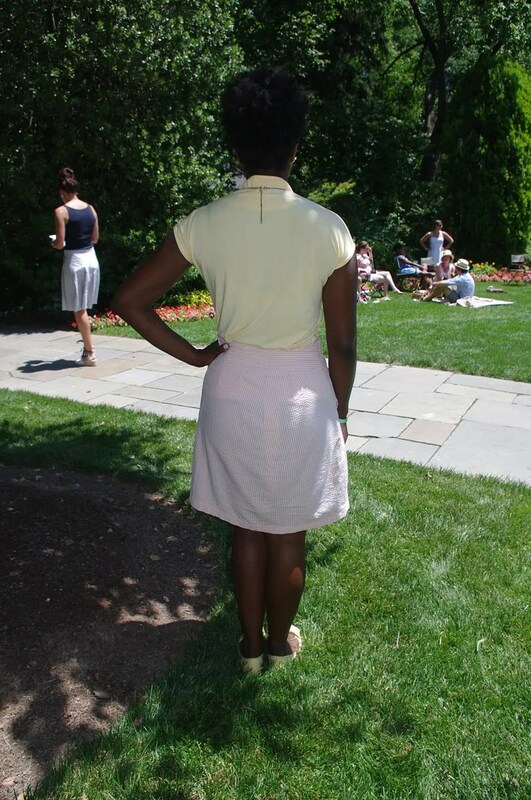 The skirt is a Burda from June 2009 edition. 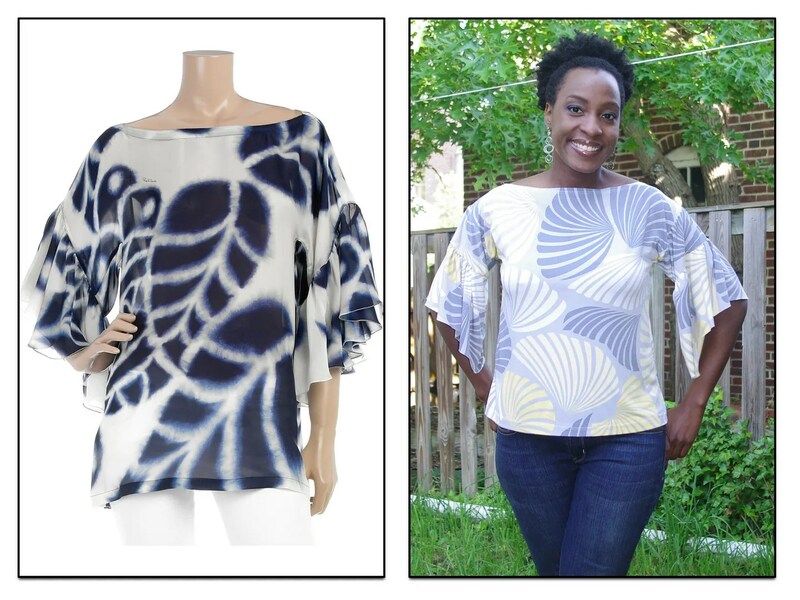 The top is a new item, from the April 2011 Burda. The fabric is a butte yellow tee shirt knit from PR Weekend in Philly. I did promise myself I would start wearing more yellow! Once I made up the yellow version, I thought the pattern was good enough to use on some leftover knits. Red link version from my four year old knit tunic. Fabric originally from Metro textiles in NYC. I would love to do all of these with some contrast binding next time. 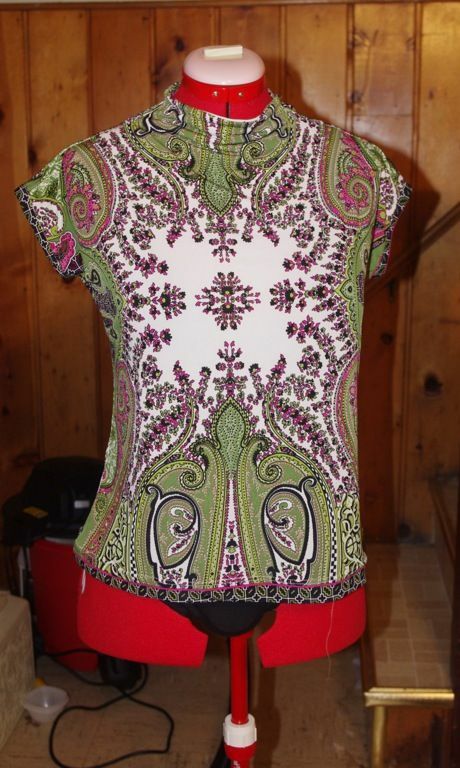 Paisley version left over from my four year old maxi dress. Fabric originally from Gorgeous Fabrics and still one of my all-time favorite prints. Yes, the designs are right on my bust point, LOL. 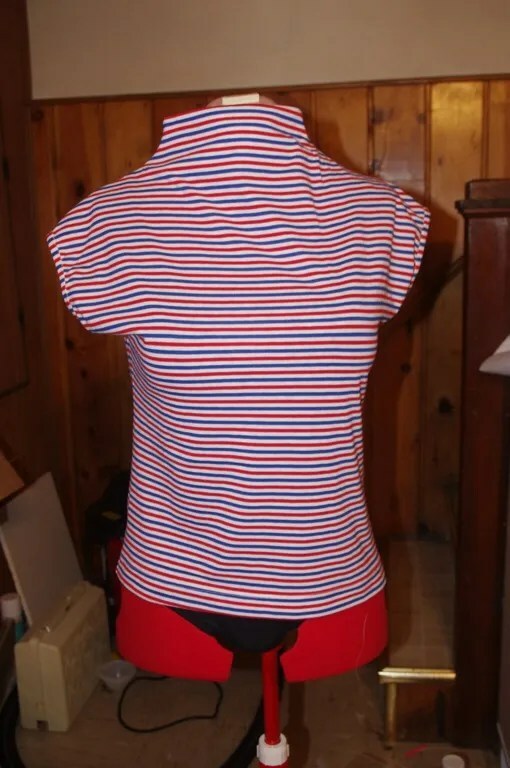 Red/ White / Blue colorway from my HP top from the Carol Collection. I have a navy blue and black version in mind too. These should go a long way in getting through summer. 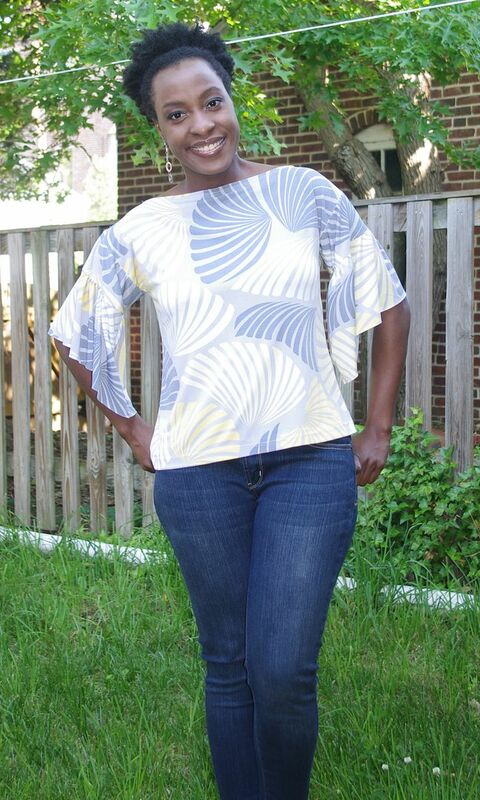 These shirts were all cut in one evening and I sewed the binding on all in about an hour. The pattern is definitely better suited for beefier knits. 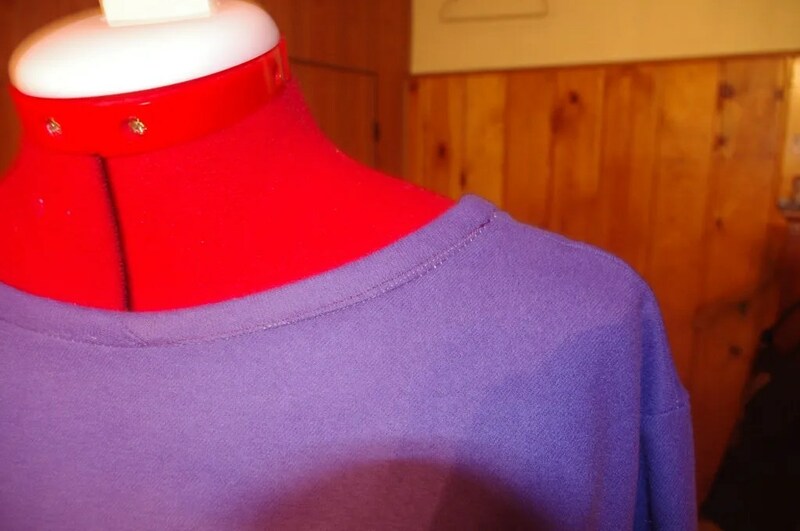 It will help the facings keep the funnel collar shape better. I omitted the zipper and made a slight FBA. And, no swayback adjustment. 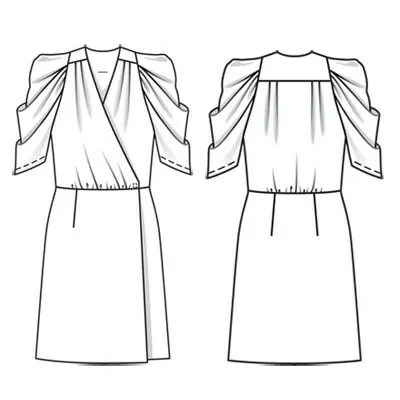 The binding uses this technique from Sarah Veblen posted on the Threads Magazine page. Be patient. Walk away from the computer. The video sometimes takes an eternity to play. I don’t know that this is ‘stash busting’. But, it’s nice to reach into my drawer and have an easy top to wear. 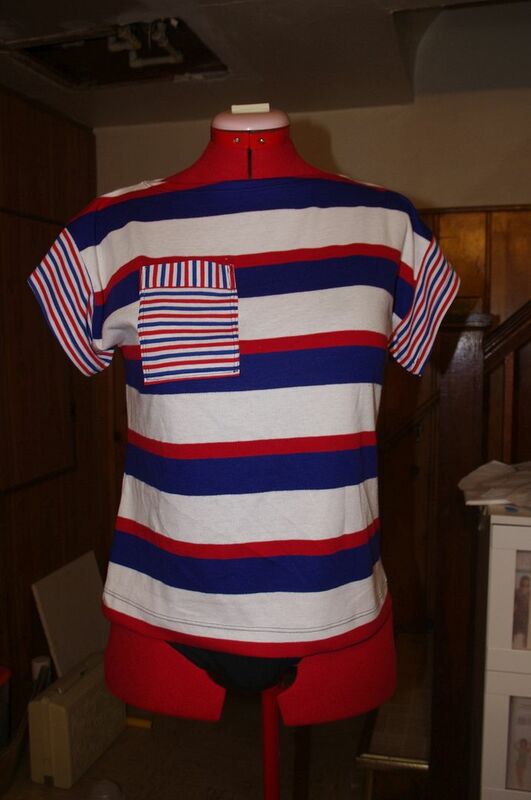 I’ll do this again with another simple pattern with some other shirts soon. 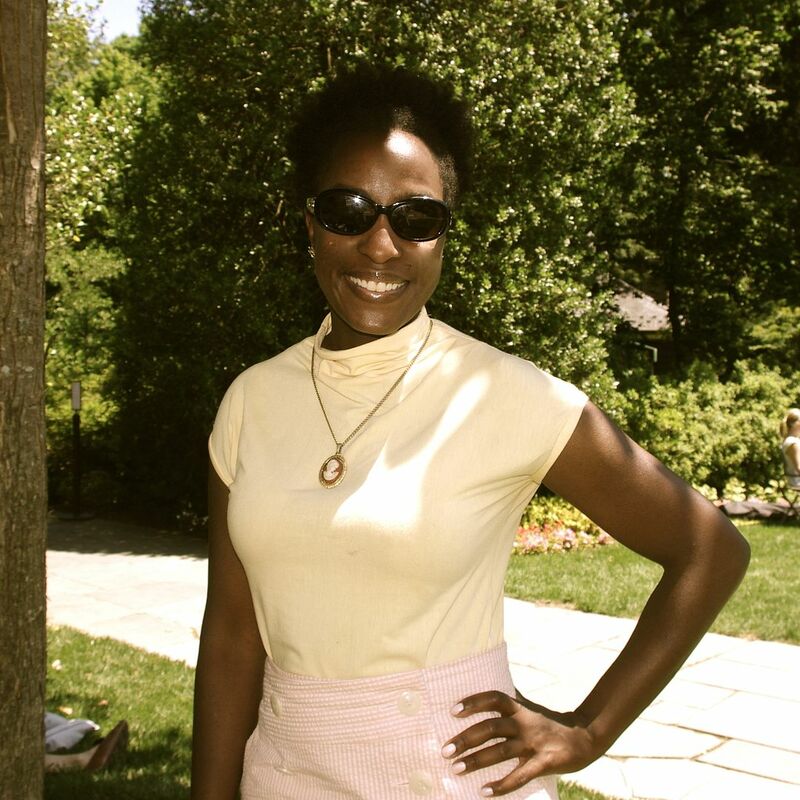 I have really got to work on some shorts or capris now…. 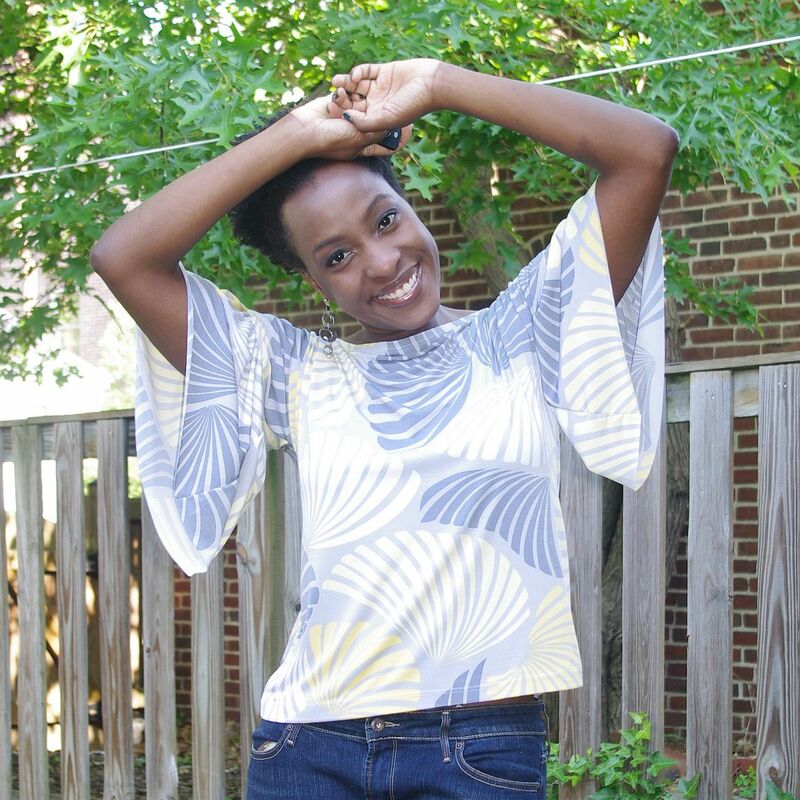 Write up on PatternReview.com is here. 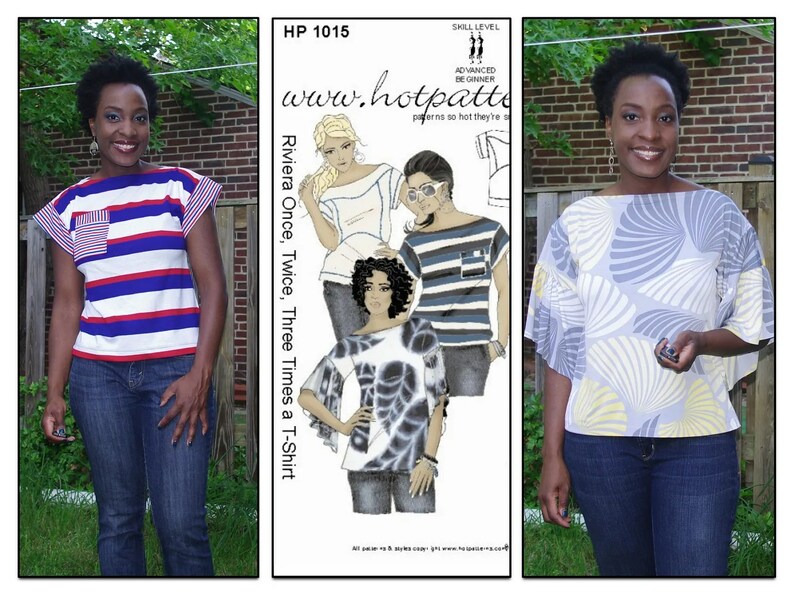 While I have a stack of Hot Patterns’ that I’ve purchased, the Once, Twice, Three Times a T-Shirt came from a friend. Almost true to the name, I made two of the three versions of this shirt. If I had a coverstitch, I probably would have made the third too. In HP, I measure in a 12 (Glamour Girl) on top and a 14 (Slinky Girl) on the bottom. I’ve read HP is closer to RTW sizing. I’m telling myself they are close to UK RTW sizing. I buy an 8 in US RTW. 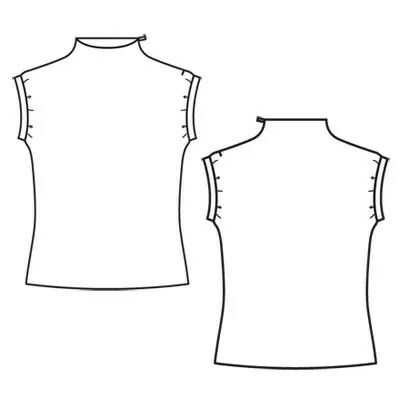 Based on reviews and the line drawing, I knew I wanted a snugger fit and cut a 10 through the upper body, an 8 at the waist and tapered back to a 12/ 14 at the hip. 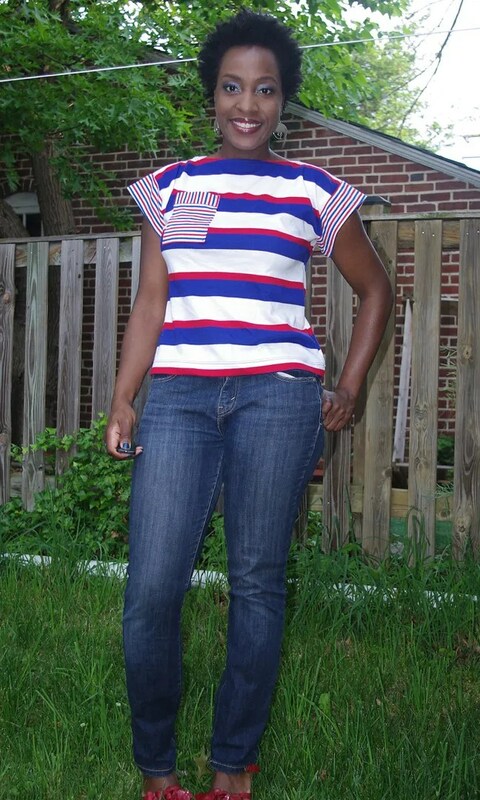 I also wanted a shorter version than drafted and took out six inches at the waist. In retrospect, I wish I had just done four inches for length. The PR Reviews noted some errors in the directions. But, I didn’t follow them. 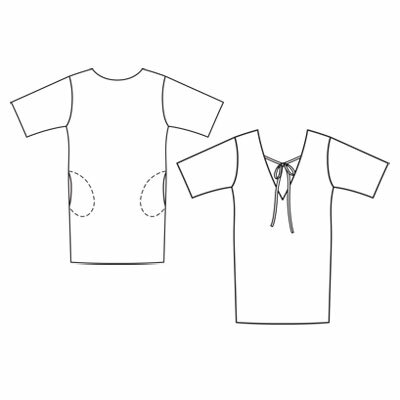 The shirts have very basic construction. All that being said, here’s the first version (note the French nauticalness of the red, white and blue). This style is based on a $500+ Chloe shirt (I do not follow fashion. I only know it’s Chloe because Erica B. pointed it out four years ago!). I made this tee up in two cotton jerseys from the Carol Collection. I always knew these were going to be a tee with contrast! 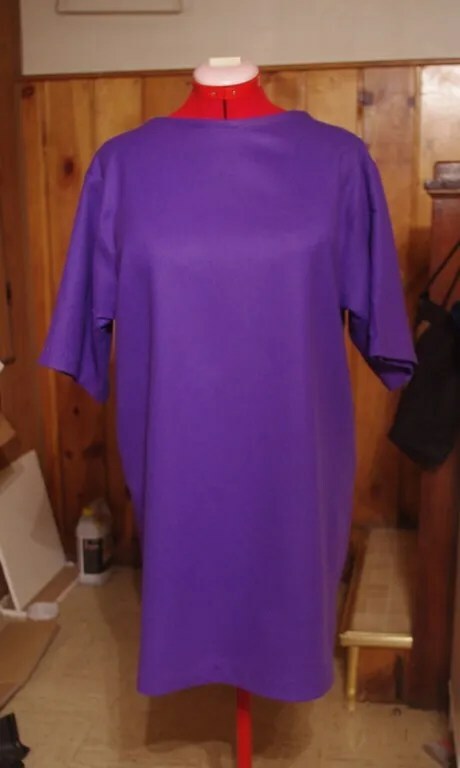 I have narrow shoulders and hate things that feel like they might drop off, so I shaped the neckline by one inch, tapering into the shoulder. As drafted, it’s more like a slit. I didn’t bother with the facings and just turned down the allowance. 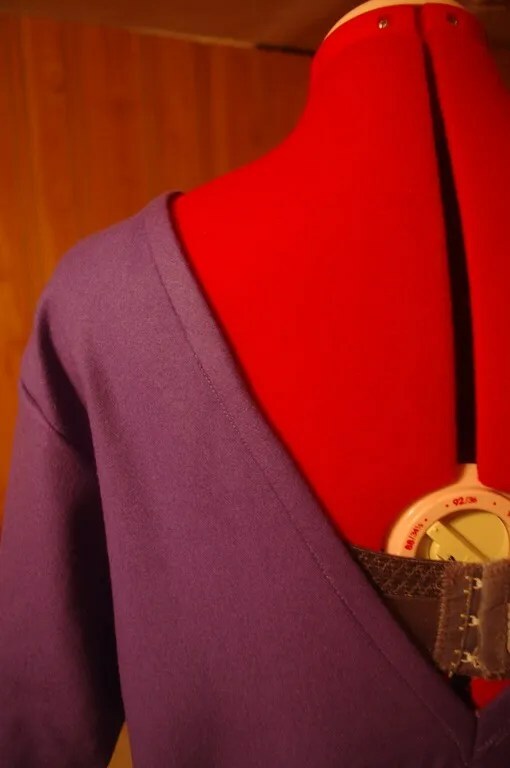 I also moved in the shoulder line by about 1 inch on each side (1/2 inch too much IMHO) to prevent my bra straps from showing or having the shirt slip off the side. The pattern doesn’t note pocket placement and I don’t like where I put it. A little over and further down would make me happier. I sewed everything on my serger, hemmed with a twin needle and interfaced all the edges with tricot interfacing. I didn’t make an FBA either. I *like* it. I don’t love it. It should have been longer and slightly more fitted to flatter my figure. My yellow version is based on a $1200 Roberto Cavalli top. 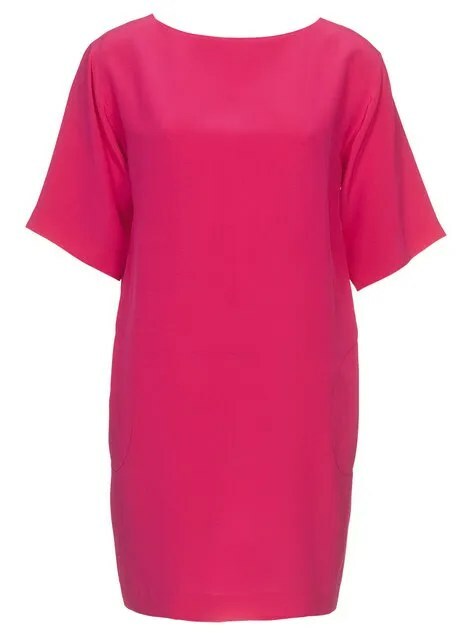 I was totally not drawn to this style until I saw Christina’s version while checking reviews.And, now that it’s made up, I am 100 percent in love with it! For this one, I moved the should line only 1/2 inch. 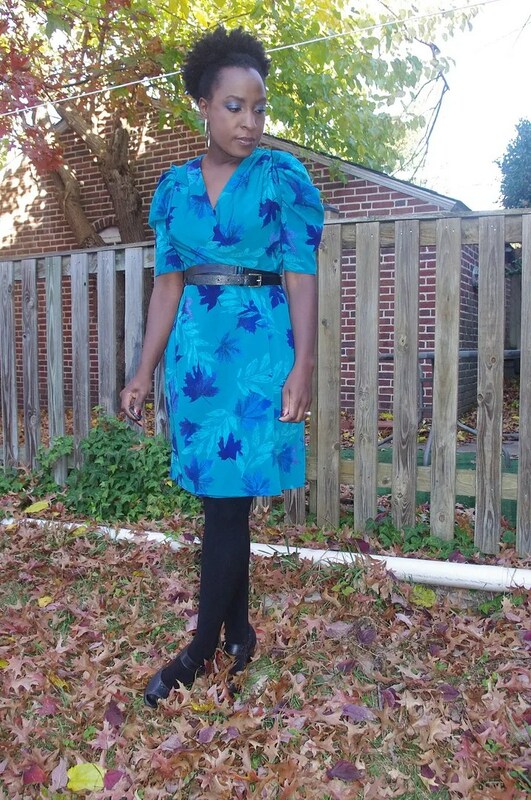 This fabric is left over from my Burda 6-2010-123 sack dress. I bought in during PR Weekend in Philly. I still have enough left over for a fitted tee! 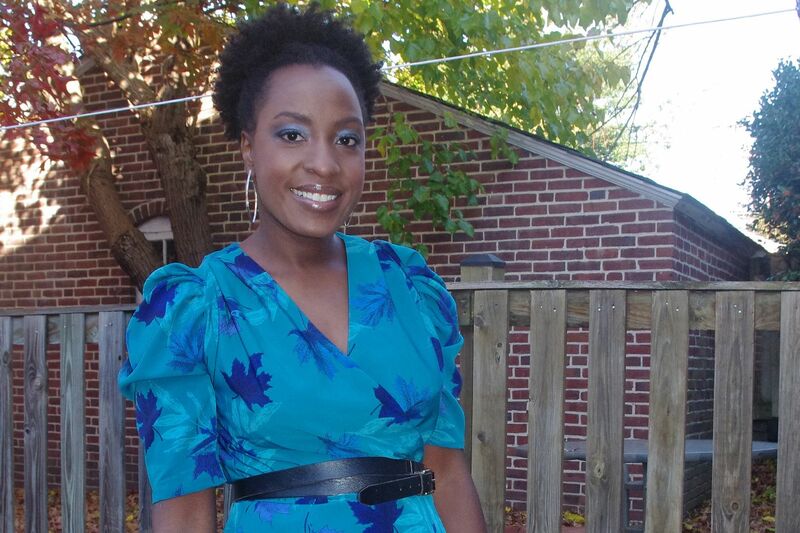 I think I thought it would be a wrap or maxi dress when I first bought it. 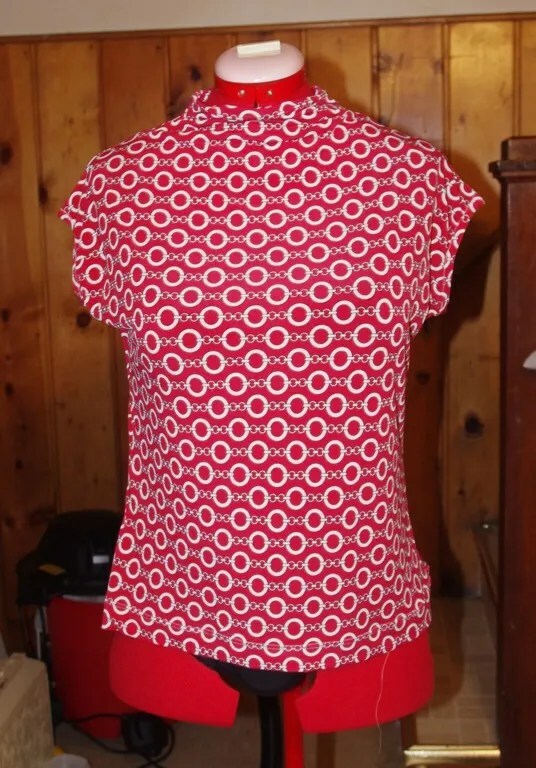 I didn’t hem the sleeves, but did finish the neckline and hem with a twin needles stitch in white. This sews up so fast it’s hard not to love. Each of these was made on a weeknight while watching TV. In the future, I’ll make it a little longer (I took too much length out). 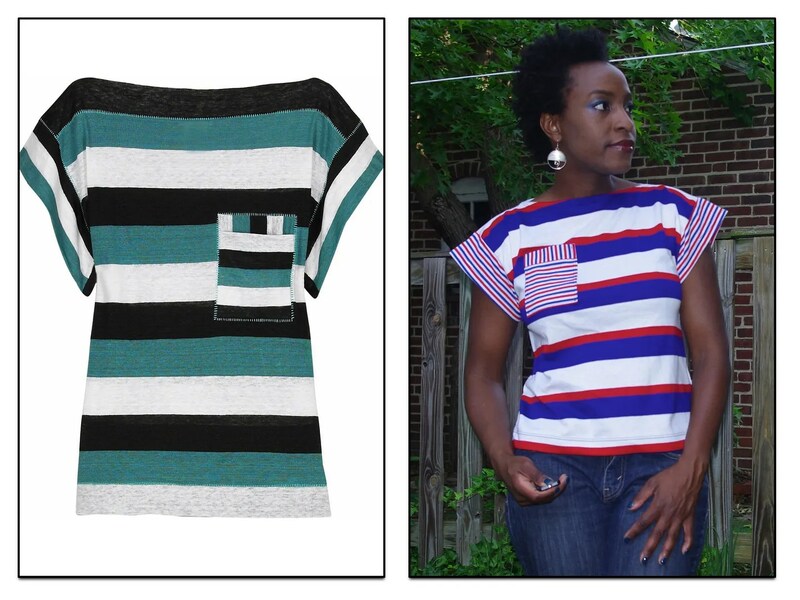 And, will have to try and resist not turning every slinky knit I have into one of these shirts. I think this pattern is good value for your dollar. You’ll get three tee shirts in one envelope. It’s awesome for a beginner too. 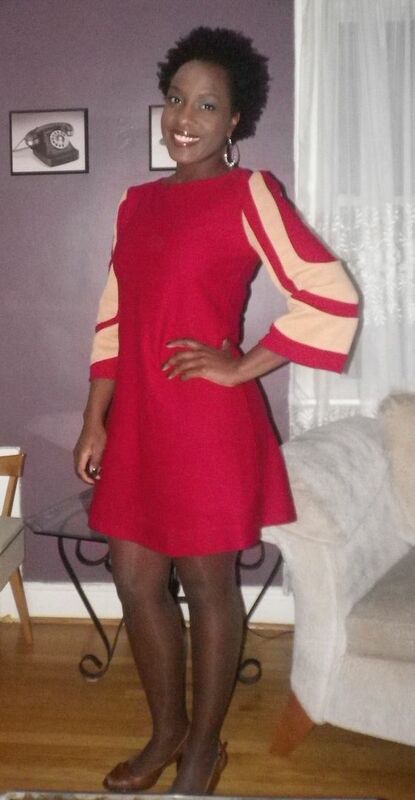 I like that it was my frequent companion’s birthday dinner and I made a dress for ME! Yes, that’s right. Part of my gift to him is to look awesome. I think that is not only fair and equitable, but simply the law of man. 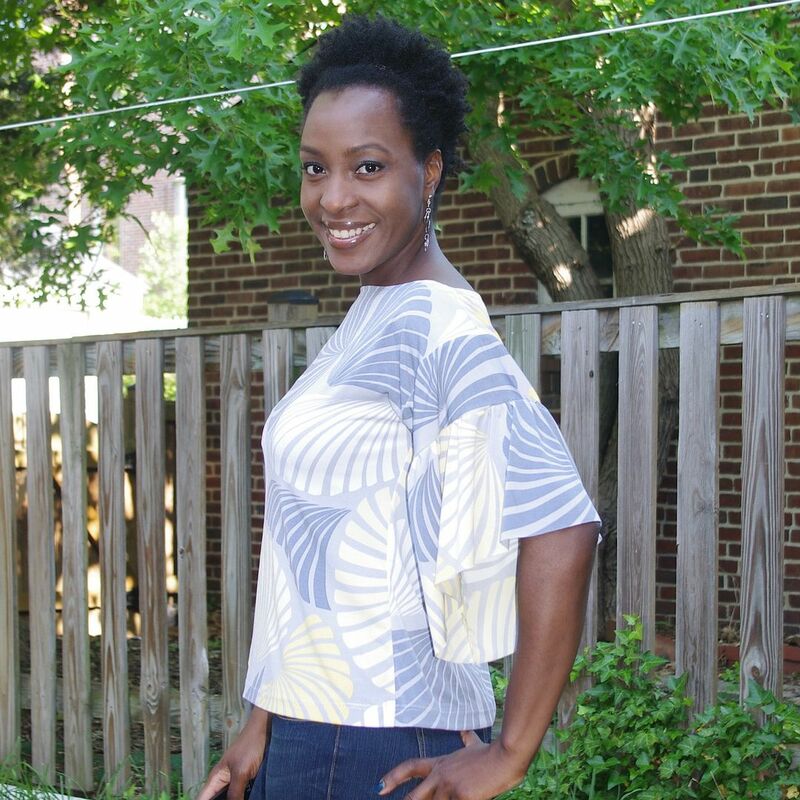 Butterick 5522 (above) is inspired by designer Trina Turk. I only know this because Cindy did an ah-Mazing job knocking it off before the pattern even came out. I know there is the occasional chatter on not posting reviews on PatternReview.com any more because of the lack of comments. I’ve been remiss in not posting reviews lately too. I still find the reviews incredibly helpful. Well, good reviews are incredibly helpful. Reviewers generally noted the lack of shape in the dress. But,this is not something I found. As I noted in my earlier post, I made a dartless FBA. I suspect I either could have made a bigger adjustment (as told by some folds pointing to my bust) or actually put in darts. 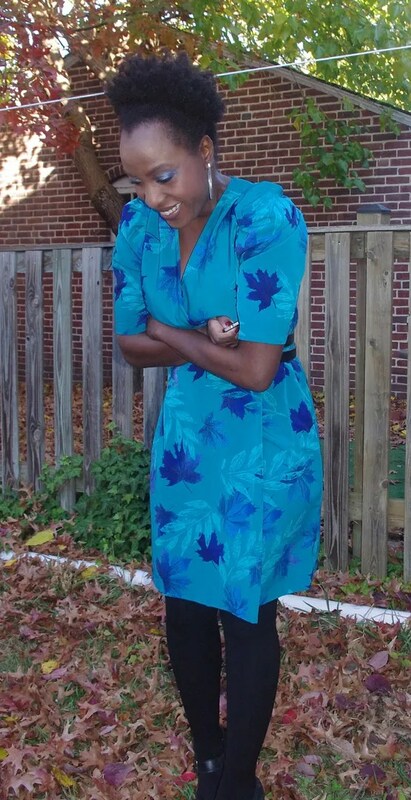 Also, I could benefit from teeny shoulder pads in this dress. I didn’t find the dress tentlike at all. 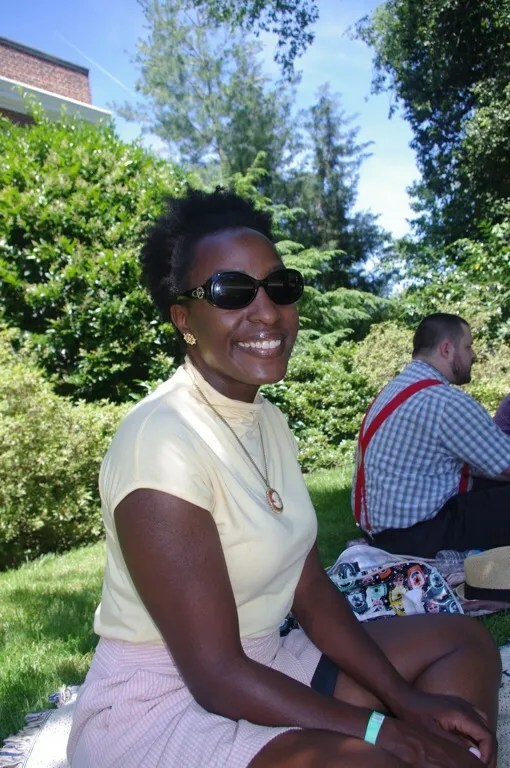 Perhaps because I’m sewing a size I wore a few years and pounds ago (!). But, more likely because I measured out the pattern 🙂 The color of this double knit is a blood red. This piece is another gem from the Carol Collection. The color is brighter in these photos because my beloved SLR is in the shop. So, I’m working with a point a shoot for the next few weeks. I made a 3/4 inch swayback adjustment and omitted the zipper. I could easily have done 1.5 inches and had a nicer fit in the back. 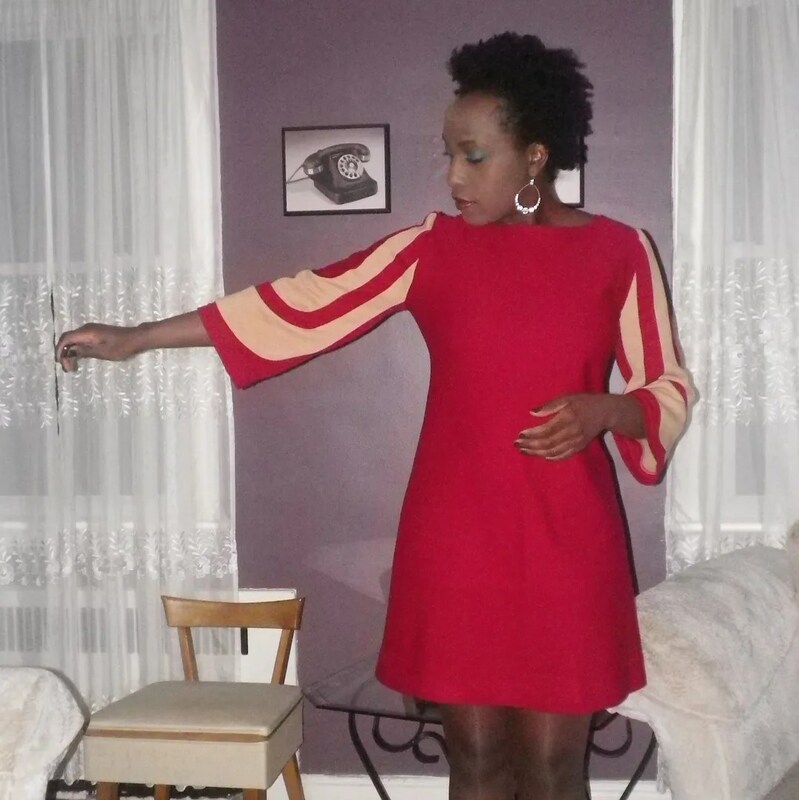 The poly doubleknit is super stable and I do a bit of wiggle to get the dress on. I hemmed by two inches from the length. Interfaced the hems and edges and used a twin needle to top stitch the hem. I really kind of wanted something shorter. In retrospect, it’s not gonna really be work appropriate at this length. But, I wasn’t thinking about work when I sewed it! The sleeves are somewhat bell shaped and pieced together. I didn’t find them to be crazy large. Maybe in a drapier fabric they would seem more elaborate. I think I would have like a larger bell. But, again, I’m a dramatic kind of girl. Overall I am very happy with this dress. It works super well on my figure and gives a lot of fashion impact with minimal effort. What’s even better is I’ve seen some women in the RTW version of this. Heh. 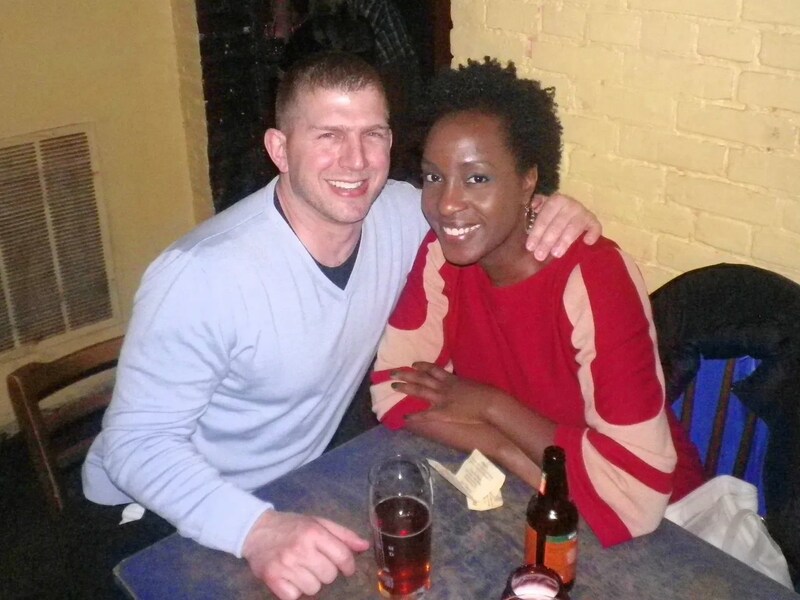 Finally, here is a photo with the birthday boy. Don’t worry, we didn’t have dinner in a basement. This is the afterparty with his friends. And, after my pontificating, I dare not neglect my review on PR.